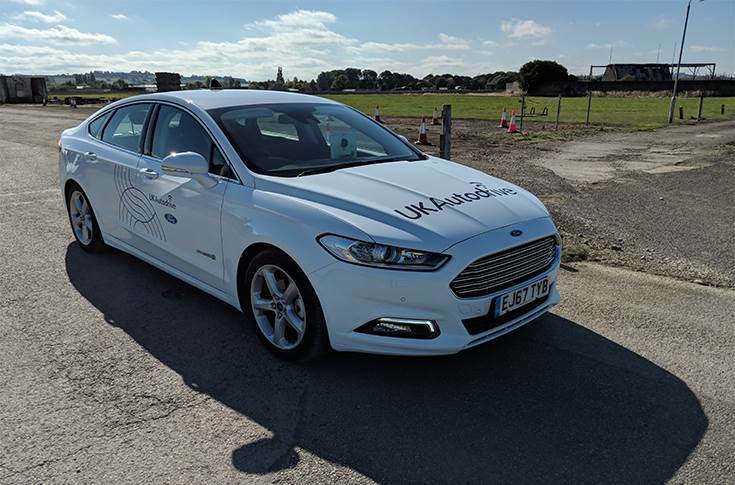 Ford is trialling a new way in which connected car technology could make the traffic lights archaic and help humans to negotiate their way through busy crowds, by slowing down or speeding up to avoid collisions, without coming to a standstill. Intersection Priority Management (IPM) – being demonstrated this week on the streets of Milton Keynes, U.K., as part of the government-funded UK Autodrive programme – aims to keep drivers driving and bring an end to unnecessary stops at junctions, both easing traffic flow and increasing safety and efficiency. Every year, the average driver spends two days waiting at traffic lights. And not only can junctions be frustrating, but they are also the cause of up to 60 per cent of road traffic accidents. Apart from saving time, avoiding stopping at junctions could also save fuel, as drivers avoid braking and accelerating away from the lights. IPM uses vehicle-to-vehicle (V2V) communications to coordinate with other vehicles in the vicinity and suggests optimum speeds that will allow cars to safely pass by each other at intersections without coming to a halt. For the trial, test cars have been equipped with V2V communication systems that broadcast the vehicles’ location, direction of travel and speed. The onboard IPM systems are able to identify an upcoming junction and the trajectory of other vehicles approaching it. It will then suggest an optimum speed for each vehicle as they approach the junction that will allow them to pass through safely. 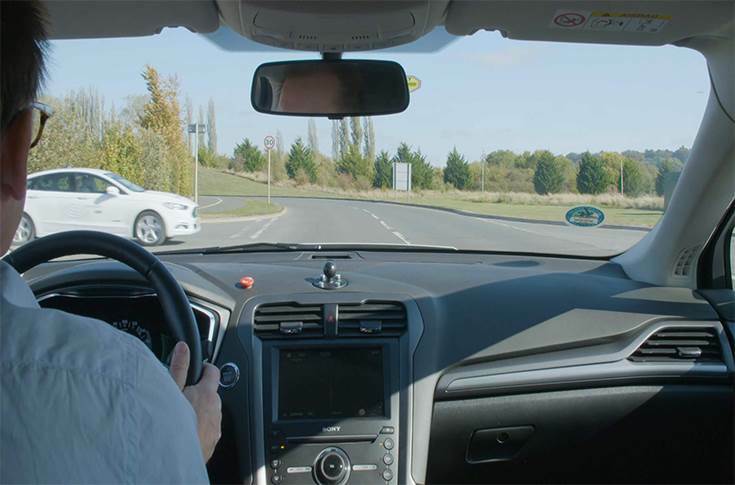 The vehicles in the trial have people behind the wheel, but it is envisaged that autonomous vehicles could also benefit from the technology. Automating how vehicles negotiate junctions with each other in this way may mean that, one day, vehicles could pass through safely and efficiently without the need for traffic lights or road signs. While today’s autonomous vehicles operate independently using the sensor technologies and map data on board, V2V and vehicle-to-everything (V2X) communications technologies could benefit the driverless cars of the future. 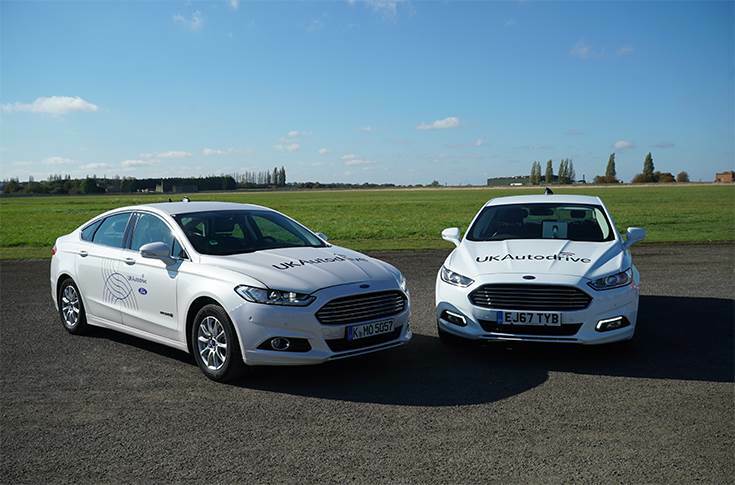 IPM builds upon other connected-car technologies developed by Ford and its project partners as part of UK Autodrive, a £20 million (Rs 195 crore) programme taking self-driving and connected car technologies from the test track to the streets. Among the technologies showcased during the two-year programme – which comes to an end this week – are Intersection Collision Warning, which alerts drivers of potential accidents when approaching an intersection, and Green Light Optimal Speed Advisory (GLOSA), which helps cars to synchronise with nearby traffic lights to help them avoid getting stuck on red. Other features demonstrated include Collaborative Parking – which builds a crowd-sourced map of a car park’s available spaces – and Emergency Vehicle Warning, where drivers are advised of the location and distance of an approaching emergency vehicle.